Hazrat Mirza Masroor Ahmad says new Mosque will be a symbol of peace. 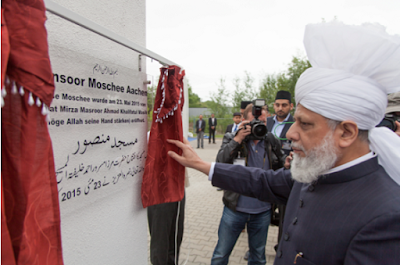 The Ahmadiyya Muslim Community is pleased to announce that on 23 May 2015, the World Head of the Ahmadiyya Muslim Community, the Fifth Khalifa, His Holiness, Hazrat Mirza Masroor Ahmad inaugurated the Mansoor Mosque (The Mosque of the Divinely Supported) in the German city of Aachen. Upon arrival, His Holiness officially inaugurated the Mosque by unveiling a commemorative plaque and offering a silent prayer in thanks to God Almighty. 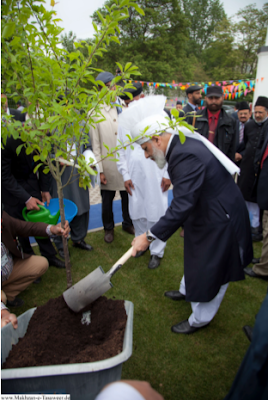 His Holiness then led the Zuhr and Asr prayers at the new Mosque before planting a tree at the Mosque premises to further mark the occasion. In the evening, a special reception, attended by more than 210 dignitaries and guests, was held to mark the opening of the Mosque. Various dignitaries and politicians such as Marcel Philipp, the Lord Mayor of Aachen and Karl Schultheis, Member of State Parliament North Rhine-Westphalia attended. The National President of the Ahmadiyya Muslim Community Germany, Abdullah Wagishauser gave a welcome address, followed by comments from various guest speakers. Thereafter the National President of the Ahmadiyya Muslim Community Germany read out a letter of support sent by Martin Shulz, President of the European Parliament. 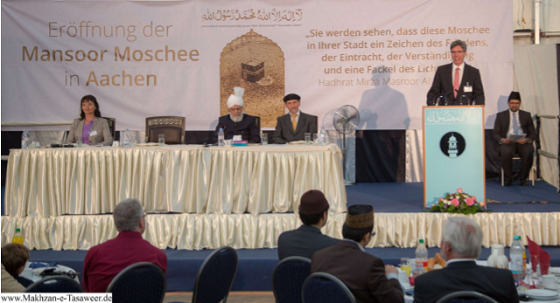 The keynote address was delivered by Hazrat Mirza Masroor Ahmad, during which he outlined the true purposes of Mosques in light of the teachings of Islam. Further, His Holiness condemned all forms of violence or extremism as completely against the teachings of Islam. Referring to an Ahmadi Muslim well known throughout the local community as the owner of a flower shop in the city centre of Aachen, His Holiness said that his shop was a symbol of how Ahmadi Muslims spread peace and goodness in their societies.